At the Wailing Wall in Israel, Homer suffers from Jerusalem syndrome and thinks he is the "chosen one." (CNN) -- Leave it to "The Simpsons" to kick off Holy Week with a zinger. Christians observe this as a sacred time marking Jesus' journey in Jerusalem from Palm Sunday to Easter, and many treat it with reverence by attending services, singing hymns and offering prayers. None likely would picture the one they deem their savior in the form of Homer Simpson. 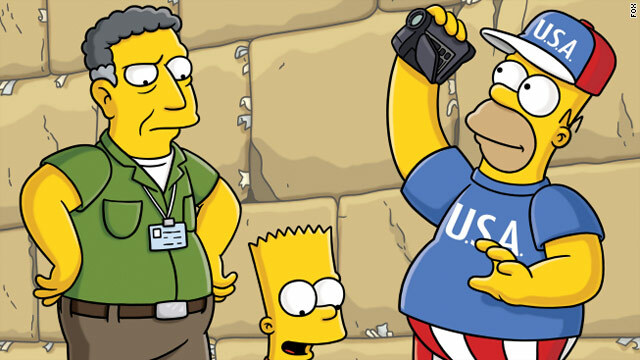 In "The Greatest Story Ever D'ohed," the latest episode of the long-running Fox sitcom, which aired Sunday, The Simpsons set off to Israel on a church mission. They go at the urging of neighbor and devout Christian Ned Flanders, who thought a dose of the Holy Land would bring Homer much-needed salvation. No surprise, this plan didn't go well. Among the family's foibles and offenses, Homer became delusional and believed he was the "chosen one," destined to bring Muslims, Jews and Christians together. Diagnosed with "Jerusalem syndrome," he called himself the "Messiah" and proposed the new faith of "Chrismujews," a religion that would praise both peace and chicken. This storyline, while certainly creative and twisted in the classic Simpsons way, is rooted in something real. At Kfar Shaul Mental Health Center in Jerusalem, doctors have long studied patients with a psychiatric disorder they call Jerusalem syndrome, a very rare condition in which tourists -- on average one or two a month -- become so overwhelmed with the power of the place that they dissociate from reality and believe themselves to be biblical figures. "I fully understand the people who are skeptical about it," said psychiatrist Gregory Katz, who directs the emergency unit at Kfar Shaul. "If I hadn't seen it myself, I also would be very skeptical. But you can't deny what you really see." While psychiatrists outside of the center debate the syndrome's existence, Katz estimated that during the past 25 years, he and his colleagues have admitted more than 450 cases. Katz told the story of a man from the Midwest who was found in the Old City of Jerusalem wearing a white robe and claiming to be the Apostle Paul. He was arrested by police and brought to Kfar Shaul after he tried to force observant Jews and Muslims to follow his ways and beliefs -- an effort that "really caused some disturbances," Katz said. Then there was the naked German found wandering in the Judean Desert. He believed he was John the Baptist and attempted to baptize strangers. The biggest challenge with him, Katz said, was that he had no identifying documents when Palestinian police got hold of him and called Kfar Shaul for help. The unusual syndrome can be divided into two categories. The first, which Katz called "pure" Jerusalem syndrome, is what afflicted the tourists he mentioned. In these cases, patients found in robes, wrapped in hotel bedsheets or wearing nothing at all have no history of mental illness. The intense break from reality includes agitation, the desire to separate from one's tour group or family, an obsession with cleanliness, wearing white and the need to preach, share hymns and march to holy places, according to a paper Katz co-authored with colleagues in 2000 for the British Journal of Psychiatry. Such bouts of pure Jerusalem syndrome last less than a week, and the patients by all counts emerge mortified. Though no one can say with certainty why a tourist suddenly turns into a would-be Messiah, prophet or Virgin Mary (the most popular character for women), Katz offered a theory. In general, the patients are highly religious Christian pilgrims -- Protestant, not Catholic, he said. Most come from rural communities, are not well-traveled and tend to be in their 40s. They arrive in Israel, often their first trip abroad, with an idealized view of Jerusalem formed through years of devout Bible study. And while it is a holy city, the reality includes traffic jams, omnipresent cell phones, political tensions and security guards outside cafes. Unable to reconcile their long-held idyllic vision with the tough reality, they have a temporary psychotic break. These "pure" syndrome cases account for about 10 to 15 percent of all incidents, Katz said. The rest, which he described as cases of "superimposed" Jerusalem syndrome, involve patients who've had a history of psychotic illness and often arrive in Israel with a specific mission and delusions about their power and influence. In these cases, when the patients are tourists, the doctors at Kfar Shaul stabilize them so they can go home and be treated in their own countries. One example would be "Samson," the body-building American tourist who came to Jerusalem determined to move one of the ancient enormous stones in the Western, or Wailing, Wall. He suffered from paranoid schizophrenia and after being calmed down with medications at Kfar Shaul, he was escorted home by his father, according to the paper co-authored in 2000 by Katz and others. Another extreme case that people have pointed to over the years is that of an Australian Christian fundamentalist who in 1969 set fire to the Al-Aqsa Mosque on the Temple Mount of Jerusalem's Old City. He said he needed to rebuild the ancient temple to help usher in Jesus' return. He was brought to trial, declared insane and deported. David Koresh, the Branch Davidian sect leader who died in a 1993 raid on his Waco, Texas, compound, reportedly had the syndrome at one point, Katz said, although Koresh's visit to Israel predated Katz's arrival. The late psychiatrist Yair Bar-El, whom Katz worked with, told Gershom Gorenberg, then writing for The Jerusalem Report, that Kfar Shaul once housed three Virgin Marys at the same time. And he told Judith Fein, in a radio interview for The Savvy Traveler, about an experiment in which he put two "Messiahs" in the same room. After an hour, Bar-El told Fein, each said, "I am the real Messiah. He's an imposter." Israel receives millions of tourists each year -- 2.7 million in 2009, according to a Tourism Ministry spokeswoman. About 54 percent are Christian, 39 percent are Jewish and the rest either identify with another religion or are unaffiliated. With only one or two being afflicted with Jerusalem syndrome a month, she said, the strange phenomenon is not something that concerns her office. And though Jerusalem is certainly unique in terms of its religious weight and influence, Katz said it's not the only tourist destination that can give people a strange psychiatric bug: In Italy, art lovers who visit Florence can suffer Stendhal syndrome, a psychotic reaction to the details of masterpieces.